Figure 1: USS Lake Champlain (CV-39) underway at sea on 23 June 1945, less than three weeks after she went into commission. Official US Navy Photograph, now in the collections of the National Archives. Click on photograph for larger image. Figure 2: USS Lake Champlain (CVA-39) at anchor in Aden harbor, 18 May 1953, while she was enroute to take part in the Korean War. Among the planes on her flight deck are a few Douglas F3D "Skyknight" all-weather fighters, parked just in front of the carrier's island. Courtesy of the Naval Historical Foundation. US Naval Historical Center Photograph. Click on photograph for larger image. 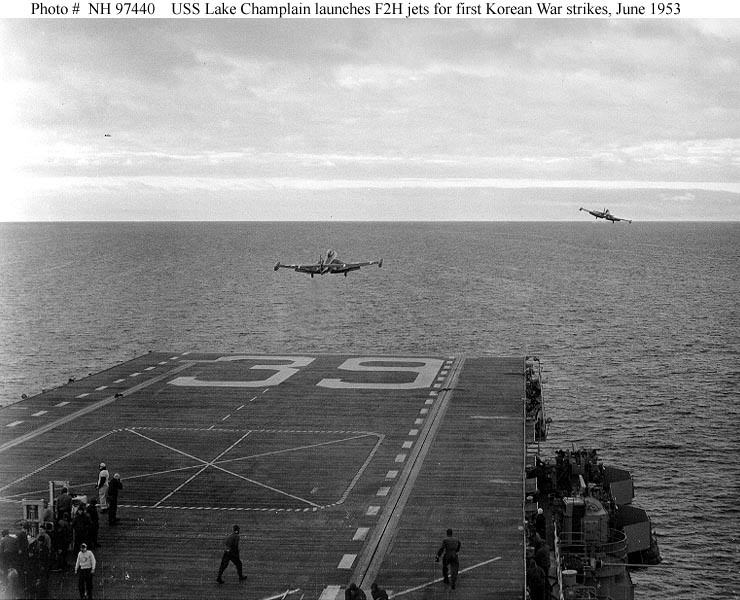 Figure 3: USS Lake Champlain (CVS-39) catapults a pair of F2H-2 "Banshee" jet fighters for her first Korean War strikes, 15 June 1953. Official US Navy Photograph, from the collections of the Naval Historical Center. Click on photograph for larger image. Figure 4: "A flight of (F2H-2) Banshees streaks over the USS Lake Champlain (CVA-39) in a photo taken by an accompanying destroyer of Task Force 77. The Essex class carrier, recently arrived in the Far East, is in her first tour of Korean duty." Quoted from original caption released with this photograph by Commander Naval Forces Far East, under the date of 18 July 1953. Official US Navy Photograph, from the collections of the Naval Historical Center. Click on photograph for lager image. Figure 5: USS Lake Champlain (CVA-39) and USS Purdy (DD-734) refueling at sea from USS Neosho (AO-143) in the Mediterranean, 20 October 1955. Official US Navy Photograph, now in the collections of the National Archives. Click on photograph for larger image. 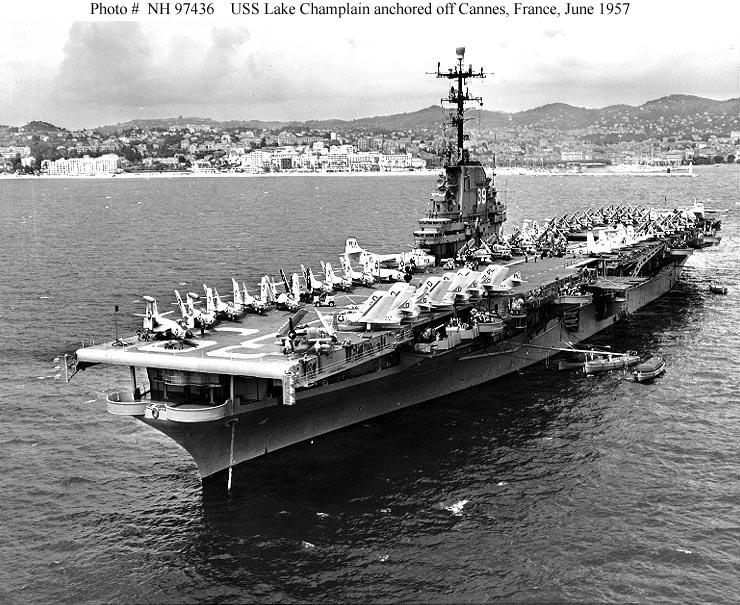 Figure 6: USS Lake Champlain (CVA-39) anchored at Cannes, France, on 17 June 1957, during her final deployment as an attack aircraft carrier. Among the planes on her flight deck are three large AJ "Savage" attack aircraft. Photographed by PH2 J.R. Sholar. Official US Navy Photograph, from the collections of the Naval Historical Center. Click on photograph for larger image. Figure 7: USS Lake Champlain (CVS-39) underway at sea. The original print bears the rubber stamp date 1 July 1960. Official US Navy Photograph, from the collections of the Naval Historical Center. Click on photograph for larger image. Figure 8: USS Lake Champlain (CVS-39) underway while conducting anti-submarine exercises in the western Atlantic, circa early 1965. The original print was received by "All Hands" magazine on 23 April 1965. Note flight deck markings on this ship, the last axial-deck fixed-wing aircraft carrier in U.S. Navy service. Official US Navy Photograph, from the collections of the Naval Historical Center. Click on photograph for larger image. Figure 9: USS Lake Champlain (CVS-39) anchored at St. Thomas, Virgin Islands, while making a liberty call after exhaustive anti-submarine warfare exercises in the Caribbean. Presence of Sikorsky HSS/SH-34 helicopters on her flight deck indicates that the photo was taken during the early 1960s. The original print was received by "All Hands" magazine on 23 April 1965. Official US Navy Photograph, from the collections of the Naval Historical Center. Click on photograph for larger image. Figure 10: Gemini Titan 2 Suborbital Test, 19 January 1965. "U.S.S. Lake Champlain -- Navy frogmen place the floatation collar around the Gemini Titan 2 spacecraft. The National Aeronautics and Space Administration launched the spacecraft from Cape Kennedy, Jan. 19, 1965 at 9:03 and it was recovered by the recovery forces aboard the U.S.S. Lake Champlain some 2100 miles downrange at 10:45 a.m. Flight time was 19:03 minutes. Actual landing was 16 miles short of the programmed landing area." Quoted from the original caption released by NASA with this photograph. Lake Champlain (CVS-39) is in the background. One of her SH-3 helicopters is hovering over the spacecraft. National Aeronautics and Space Administration Photograph, from the collections of the Naval Historical Center. Click on photograph for larger image. 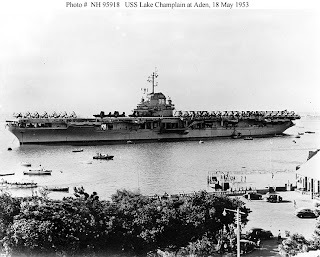 Named after a lake in New York where a major naval battle was fought during the War of 1812, USS Lake Champlain (CV-39) was a 27,100-ton Ticonderoga class aircraft carrier that was built by the Norfolk Navy Yard at Portsmouth, Virginia, and was commissioned 3 June 1945. 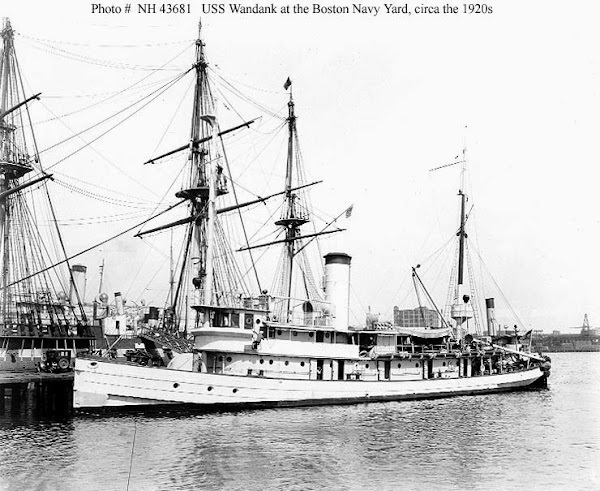 The ship was approximately 888 feet long and 147 feet wide, had a top speed of 33 knots, and had a crew of 3,448 officers and men. 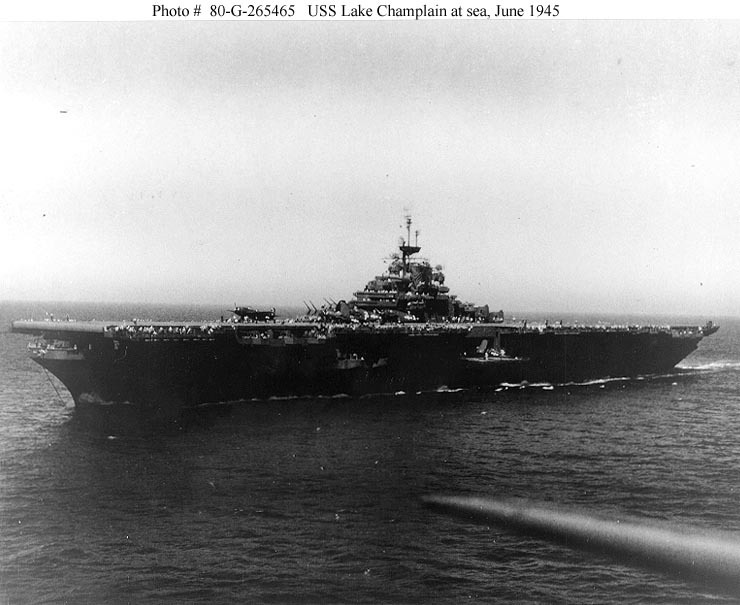 As built, Lake Champlain was armed with 12 5-inch guns, 32 40-mm guns, and 46 20-mm guns, and carried approximately 80 aircraft. After a very brief shakedown cruise off the coast of New York, Lake Champlain participated in Operation “Magic Carpet,” which was designed to transport large numbers of American troops back to the United States from post-war Europe. 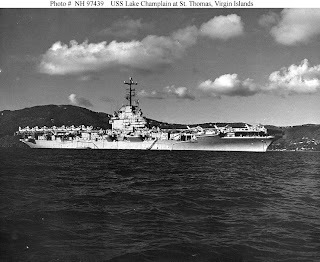 Lake Champlain left Norfolk, Virginia, on 14 October 1945 and arrived in Southhampton, England, on 19 October. She immediately brought back a large number of American troops to the United States. On a subsequent transport trip completed 26 November 1945, Lake Champlain set a speed record for crossing the Atlantic when she arrived at Hampton Roads, Virginia, after having completed a run from Cape Spartel, Morocco, in 4 days, 8 hours, and 51 minutes. This record stood until it was beaten by the SS United States in the summer of 1952. 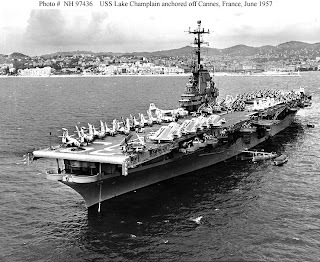 Lake Champlain was decommissioned on 17 February 1947 and remained in reserve until the start of the Korean War in 1950 increased the demand for aircraft carriers. 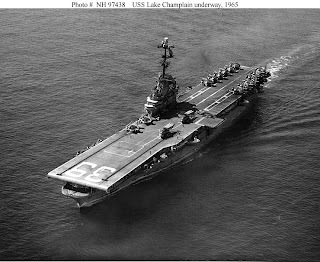 Lake Champlain was taken out of reserve and overhauled to accommodate the new jet aircraft that were entering the Navy. She was given a strengthened flight deck, a new “island,” and many other modifications. 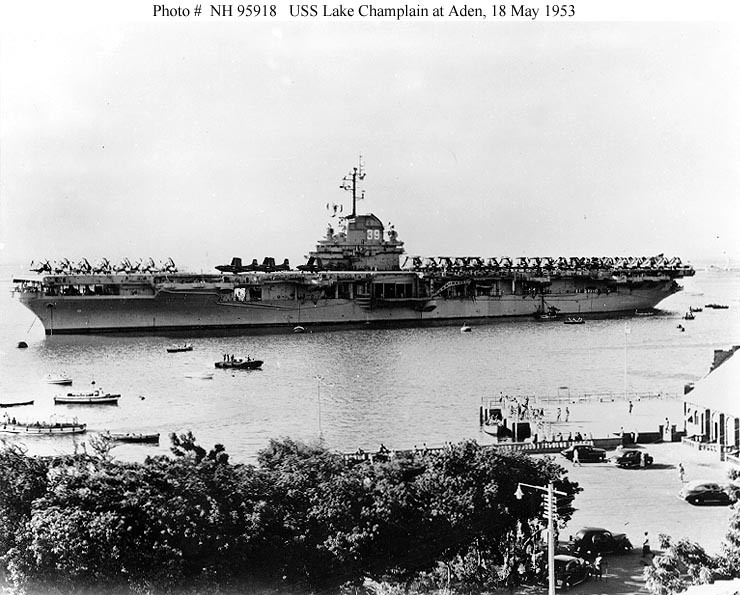 Lake Champlain was modernized at the Newport News Shipbuilding & Drydock Company at Newport News, Virginia, and she was re-commissioned on 19 September 1952. 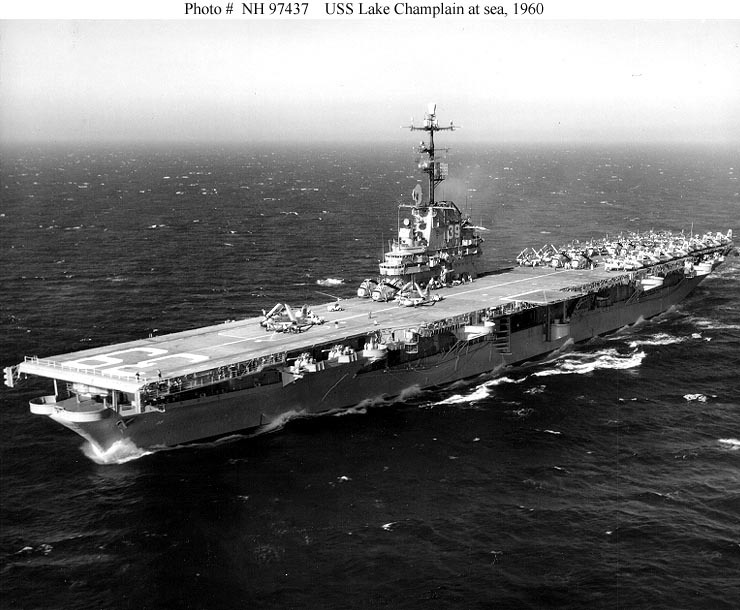 After completing her modernization, Lake Champlain was also re-designated CVA-39. 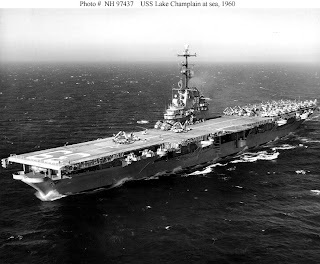 After a brief shakedown cruise off Cuba and Haiti from 25 November to 25 December 1952, Lake Champlain set sail for Korea on 26 April 1953. She arrived at Yokosuka, Japan, on 9 June 1953. 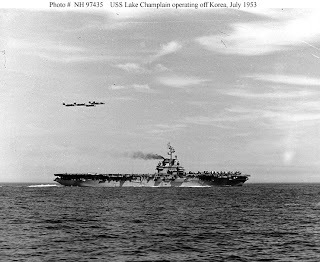 Lake Champlain was made flagship of Carrier Task Force 77 and steamed out of Yokosuka on 11 June, arriving off the west coast of Korea three days later. The carrier’s air group immediately launched missions that destroyed enemy airfields, attacked enemy troop concentrations, and provided close air support for US and United Nations troops on the ground in Korea. Her planes also escorted American bombers on the way to their targets. 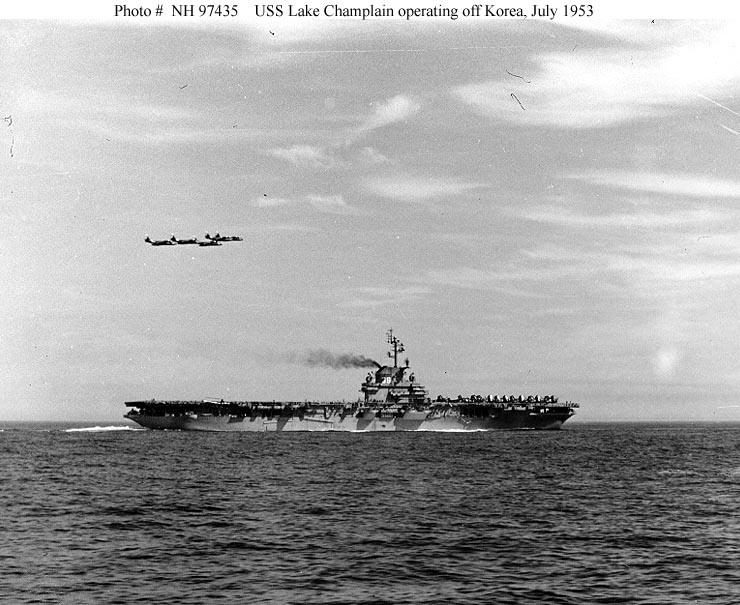 Lake Champlain’s aircraft continued their air strikes until an armistice was signed on 27 July 1953. Lake Champlain remained in the area until 11 October, when she was relieved by USS Kearsarge (CVA-33). Lake Champlain headed toward the South China Sea and arrived at Singapore on 24 October. She left the Pacific on 27 October and headed home via the Indian Ocean and the Mediterranean Sea and arrived at Mayport, Florida, on 4 December 1953. For the next four years, Lake Champlain made several cruises with the Sixth Fleet in the Mediterranean. In August 1957, the ship was converted into an anti-submarine warfare support aircraft carrier and re-designated CVS-39. While in that role, Lake Champlain patrolled the Atlantic, the Caribbean, and the Mediterranean for another eight years. Lake Champlain also participated in the “Quarantine” of Cuba in October and November of 1962. 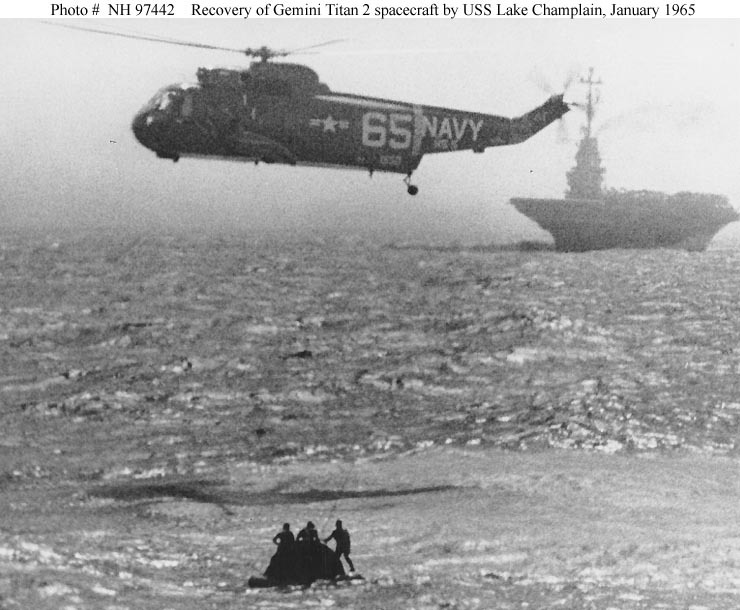 In addition to her normal anti-submarine activities, Lake Champlain conducted midshipmen training cruises, acted as a recovery ship for manned space flights, and assisted in a hurricane relief operation in Haiti in 1963. 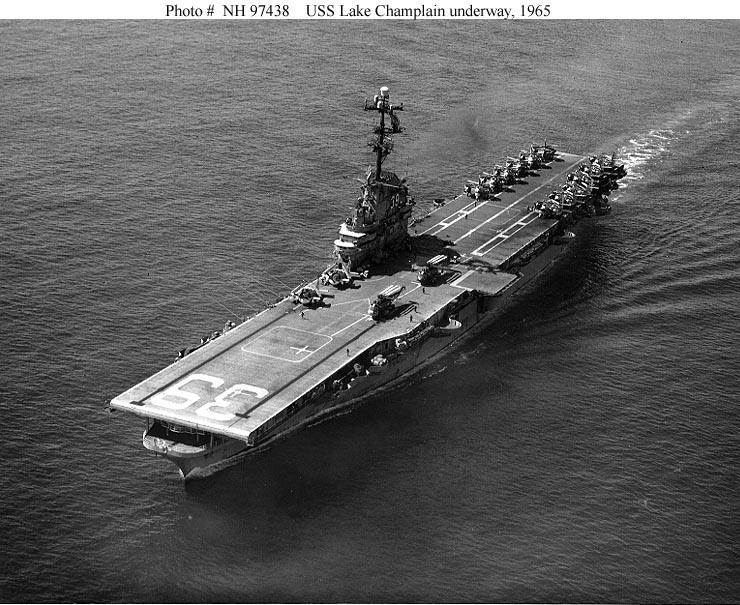 By the early 1960s, Lake Champlain had become the only “axial” (or straight) flight deck fixed-wing aircraft carrier in the fleet, while all of the other fixed-wing carriers had adopted the angled flight deck. As time went on, Lake Champlain was incapable of safely handling newer and heavier fixed-wing aircraft. That, plus the introduction into the fleet of the much larger “super” carriers, made the ship obsolete. 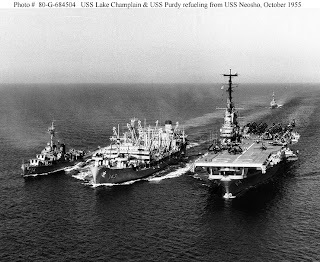 USS Lake Champlain was decommissioned on 2 May 1966 and was sold for scrapping in July of 1972.